Currently, sea levels are “believed to be” rising at a rate of 1.7-1.8 millimeters/year. In a new paper just published in the journal Climate of the Past, 7 scientists detail the long-term context for the modern rates of sea level rise. Between 16,500 years ago and 8,200 years ago, the average rate of global sea level rise was 1.2 meters per century (12 mm/yr), which is about 700% faster than the rate achieved during the last 115 years. … Included in that rate average is the “meltwater pulse” epoch around 14,500 years ago, when sea levels rose at rates of 4 meters per century (40 mm/yr). Other scientists recently suggested that hemispheric-scale sea levels rose by 12 to 22 meters in just 340 years 14,500 years ago, which is 3.5 to 6.5 meters per century. This explosive sea level rise coincided with a Northern Hemisphere-wide warming event of 4 to 5 °C within a span of a few decades, but it did not coincide with a change in CO2 levels. J.F. 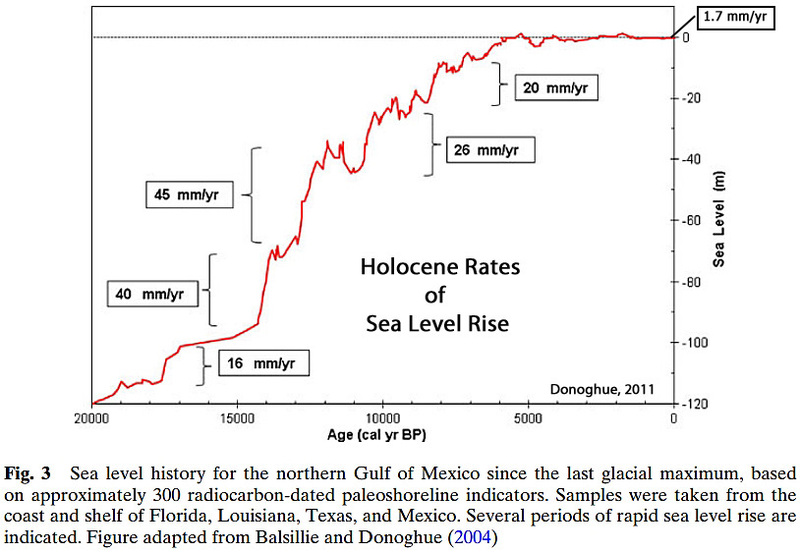 Donoghue (2011) puts the historical magnitude of the “more than 20 times that of today” sea level rise rates into perspective. Shorelines would have necessarily retreated by as much as 40 meters per year – 75 centimeters per week – during those centuries of obscene sea level rise. Furthermore, Donoghue specifies that during the last 20,000 years, the overall average sea level rise has been 6 mm/yr, which is more than 3 times the rate of the last century. In other words, modern rates of sea level rise have significantly decelerated compared to the overall long-term trend. UK geologist Dominic Hodgson and colleagues have determined that sea levels rose at rates of 1.2 to 4.8 meters per century near East Antarctica about 10,000 years ago, when sea levels were 8 meters higher than they are now. Hodgson et al., 2016 Rapid early Holocene sea-level rise in Prydz Bay, East Antarctica … The field data show rapid increases in rates of relative sea level rise of 12–48 mm/yr between 10,473 (or 9678) and 9411 cal yr BP in the Vestfold Hills and of 8.8 mm/yr between 8882 and 8563 cal yr BP in the Larsemann Hills. … The geological data imply a regional RSL [relative sea level] high stand of c. 8 m [above present levels], which persisted between 9411 cal yr BP and 7564 cal yr BP, and was followed by a period when deglacial sea-level rise was almost exactly cancelled out by local rebound. And Zecchin et al. (2015) have suggested that “episodic” and “rapid” sea level rises could reach 6 meters per century (60 mm/yr) for hundreds of years at a time. That’s about 35 times the current rate. In sum, there has been nothing unusual about the modern rates of sea level rise over the last century. Actually, sea levels are currently rising at less than a third of the average rate (6 mm/yr) of the last 20,000 years (Donogue, 2011). 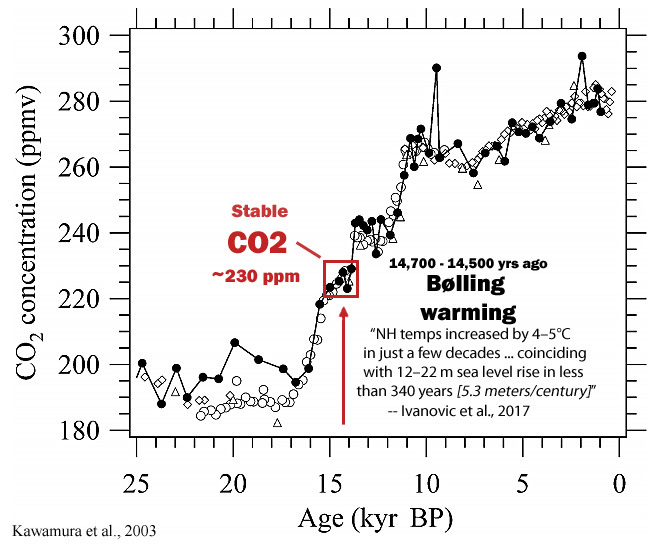 The continuance of this long-term deceleration during an era of allegedly significant anthropogenic climate influence strongly suggests that abrupt sea level rise (and fall) occurs independently of the variations in the atmospheric CO2 concentration. …except that without them, there would be no science. I have to laugh when the warmists tell me how rapidly the seas will rise. The reason is that they barely rose that fast when there was a lot of ice that could melt. As this gif shows, it melted already. Sure, there’s still some left, but nowhere near as much, and it’s further North. No way the oceans will rise that fast. More good material can be had by searching on “Nils-Axel Mörner.” I especially enjoy his videos. The fraud perpetrated by NOAA must go on. I think your acceleration units need to read mm/y^2, not mm/y (which is sea level rise rate). Only 3,000+ years til Al is right, then. Every day that goes by without prominent scientists calling this out they are damaging all of science. Newspapers, blogs, movies are full of hysterical claims about this they know are wrong. The seas are rising! The seas are rising! was probably the dumbest of all the scare screeches from the stupid AGW advocates. Utter mindless nonsense! And yet they most banal of them e.g. Al Gore, still carry on reciting this scary idea. There is no abnormal sea level rise. Period! There is NO evidence of accelerating sea level rise. Nature is still on course despite some people’s attempt at overhyping man’s might. where the comments are a hoot!